A blog about all things food! Looking for something healthy and delicious? Then you’re definitely going to want to write this one down! Traditional pesto is made with basil and in case you didn’t know yet, I’m probably the only Italian who loathes basil. Not proud of admitting this, especially since I love to cook and a lot of people think I’m insane, but I just can’t even smell the stuff honestly. Anyway, In place of that other green leaf, I use spinach in my pesto. Spinach has a light and fresh (not overpowering) taste that pairs perfectly with some roasted garlic. The prep is pretty simple and the pesto makes for a great alternative to heavy gravy. Drizzle fresh garlic with EVOO ,wrap in foil , and roast for about 30 minutes. For a quick alternative, saute the fresh whole garlic cloves in some EVOO in a pan over medium heat until light brown (unless you prefer raw garlic, which tends to be very strong). In a large pot, heat water on high with some EVOO and salt, once boiled add pasta (whole wheat pasta tends to take a little longer than normal pasta to cook, unless al dente is desired). Combine fresh spinach leaves, 3 tablespoon EVOO, roasted or sauteed garlic cloves, crushed red pepper, and salt in a food processor or mini chopper. Chop until the ingredients are a paste consistency, if combination seems dry add some more EVOO to moisten. Drain pasta and mix together with pesto. 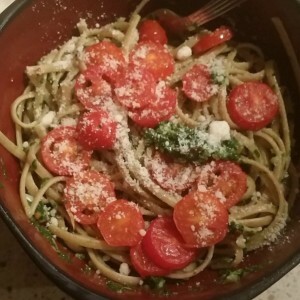 Serve with sliced grape tomatoes and top with fresh grated Parmesan cheese. Sign up to receive emails with the latest news and updates!